The youngest person in the history of the United States to be executed-framed in the name of racism. Most do not recognize the name George Stinney Jr. His story was horrific, ground-breaking, and incredibly devastating, yet when asked if they know the name, most will shake their heads. This is a perfect example of the racist culture we live in. George’s story is one of the thousands of cases in America that were unjust and discriminatory. This is what happened to him. George lived in South Carolina. He was fourteen years old at the time and lived with his mother, his father, and his younger sister. They were a black family living in the South, during the era of excessive Jim Crow laws. In the winter of 1944, Mary Emma Thames (8) and Betty June Binnicker (11) were found murdered in the woods near George’s house; they were beaten to death, and they were both white. Without any real evidence, and without George’s parents present, police arrested fourteen-year-old George in his home. He was questioned for a very short amount of time, again without his parents present and without an attorney present. His trial was extremely short; it only lasted two hours, and the judge sentenced him in a matter of minutes. An all-white jury was present, but no witnesses were even called to be there. No documentation remains of a so-called confession or even of the trial. George lived in a cell for eighty-one days after that, clutching a bible to his chest and swearing his innocence to anyone who would listen. Authorities denied him visitation with his parents or sister. On June 16th, 1944, George was executed by electric chair, making him the youngest person to be executed in the United States. You might be familiar with the Tom Hanks movie, or the book written by Stephen King, The Green Mile. Released in 1999, the character “John Coffey” was inspired by George’s story; with alterations, of course. In this story, “John” was an adult man convicted of the same crime the real fourteen-year-old boy was executed for. In 2014, George’s case was reopened and he was found innocent. As it turns out, the weapon used to murder Mary and Betty was heavier than all of George’s body weight. There was no possible way for him to even lift the weapon. George had nothing to do with the case, except for that the police needed someone to blame. 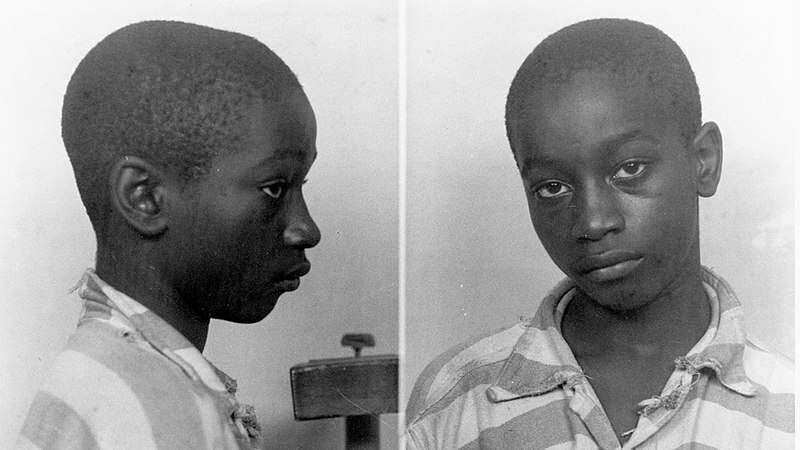 Now you know George Stinney Jr.’s name, and what happened to him. What is important now is the recognition of the fact that similar situations to George’s are absolutely countless in America. Hate crimes were the norm, and the death penalty is still a (highly controversial) consequence for some; America’s history is built on a system of oppression and hatred. To deny this would be casting aside the life and importance of George Stinney Jr. and everyone he represents.